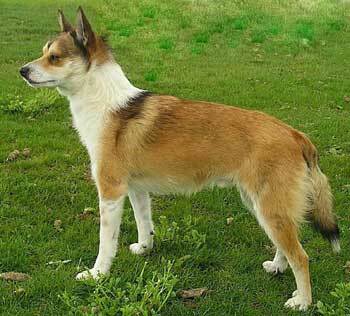 Plexidor Pet Doors: Rare Breed Monday: Norwegian Lundehund, the six-toed dog. Rare Breed Monday: Norwegian Lundehund, the six-toed dog. The Norwegian Lundehund is also called Norsk Lundehund or the "Puffin Dog." It is a small and agile Spitz with several unique characteristics. It has six toes on each foot, prick ear that fold closed - backwards or forwards at will - and a unique ability to tip its head backwards until it touches the back bone. The head isn't the only extremely agile part. The Lundehund has a great range of motion in all its joints, allowing it to fit into and get out of narrow passages. The extra toe makes it good at climbing. on each paw? Image from wikipedia. The Lundehund is described in writing as far back as the 1500s, and originated in remote parts of Norway where it was used to wrestle and retrieve live Puffin birds from the crevices of steep vertical cliffs. The extra toe was particularly useful for these balance acts. The breed was as good as extinct after the second world war, and all dogs alive today stem from five dogs found on a remote island in the Arctic Ocean. No other breed was ever on the island. This is a loyal and playful companion with excellent personality. They are easy to live with and their coat require minimal upkeep. On the downside, the Lundehund has a digestive disorder that makes it difficult to absorb nutrients from food. In extreme cases, the dog can starve even though it is well fed. These are small dogs, 14-15 lbs and approximately 12-16 inches tall.